A stretch of the Caledonian Canal is to remain closed to traffic for longer than expected due to a delay completing a major refurbishment. Scottish Canals said it had encountered "unexpected issues" with the "the historic fabric" of the lock chambers at Fort Augustus and nearby Kytra. The canal has been closed and drained between Fort Augustus and Kytra since the start of the year. It was to reopen this month, but the date has been put back to 17 April. Opened in 1822, the waterway runs between Inverness and Fort William. The refurbishment project involves replacing lock gates at Fort Augustus and Kytra. 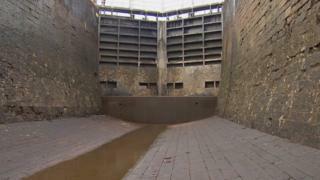 Scottish Canals said the challenges encountered were to do with the installation of the new lock gates - which use an "innovative structural system" - into the historic walls of the lock chambers. It said the system had been developed to minimise any impact of the works on the canal's designation as a scheduled monument, and the delay was from making sure the project was completed "safely and sensitively". Peter Robinson, head of engineering at Scottish Canals, said: "While our teams have been working seven days-a-week to complete the refurbishment of the lock gates, caring for the infrastructure of this 200-year-old scheduled monument - and ensuring we do so in a safe and considerate way - is not without its challenges. "We would like to thank our boating customers for their understanding during the project, which will safeguard the future of the canal for years to come."